THIS JUST IN- PETER PARKER TO RETURN TO LIFE TO BECOME SPIDERMAN AGAIN! I know this Superior Spiderman thing has only been going on for a year but it feels like an eternity to me. I am not one of those angry fan boys who writes 20 million angry letters to the editor. The Superior Spiderman storyline just did not do anything for me though. In the spectrum of all comics, it just did not say you must buy me. From a guy who has 3 boxes of Spiderman comics in his house that is saying something. Well I need not be morose anymore when looking for Spiderman. Amazing Spiderman #1 will relaunch in April 2014 we Spidey fans need to get together and have a party or something. The date of course coinsides with the launch of the next movie. I will have more on it and where the Amazing Spiderman movies are headed later. 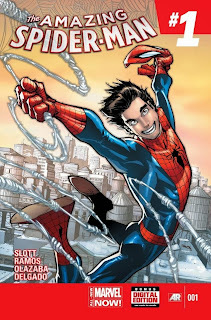 Until then enjoy this view of the cover of the April issue with Peter Parker back in all of his webbed glory! Does anyone have any ideas on how they will bring back Peter?